What Day Of The Week Is May 9? 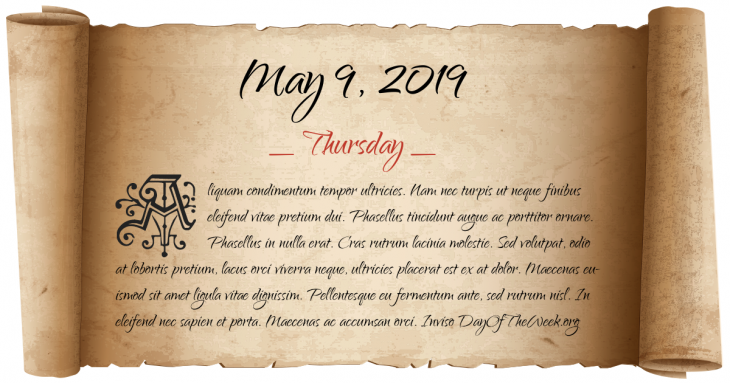 May 9, 2019 is the 129th day of the year 2019 in the Gregorian calendar. There are 236 days remaining until the end of the year. The day of the week is Thursday. Thomas Blood, disguised as a clergyman, attempts to steal England’s Crown Jewels from the Tower of London. Five men arrested during a raid on Mother Clap’s molly house in London are executed at Tyburn. A magnitude 8.8 earthquake off the coast of Peru kills 2,541, including some as far away as Hawaii and Japan. The works of Gabriele D'Annunzio placed by the Vatican in the Index of Forbidden Books. World War I: Germans repel the British’s second attempt to blockade the port of Ostend, Belgium. World War II: The Channel Islands are liberated by the British after five years of German occupation. Estonia ratifies the European Constitution. Who were born on May 9?